On a hot afternoon in late June, I pulled to the side of a two-lane desert highway in eastern New Mexico, next to a specific mile marker. An hour earlier, a woman had told me to wait for her there at three o’clock, ‘sharp’. I edged as far off the shoulder as I could, to avoid being seen by passing traffic, and parked facing the wilderness. A sprawling, high desert plateau was set out before me, its terrain a maze of raised mesas, sandstone survivors of differential erosion. Beyond the plateau, the landscape stretched for miles, before dissolving into a thin strip of desert shimmer. The blurry line marked the boundary between the land and one of the biggest, bluest skies I’d ever seen. I had just switched off the ignition when I spotted a station wagon roaring toward me from the plateau, towing a dust cloud that looked like a miniature sandstorm. Its driver was Jill O’Bryan, the wife and gatekeeper of Charles Ross, the renowned sculptor. Ross got his start in the Bay Area art world of the mid‑1960s, before moving to New York, where he helped found one of SoHo’s first artist co-ops. In the early 1970s, he began spending a lot of time here in the New Mexico desert. 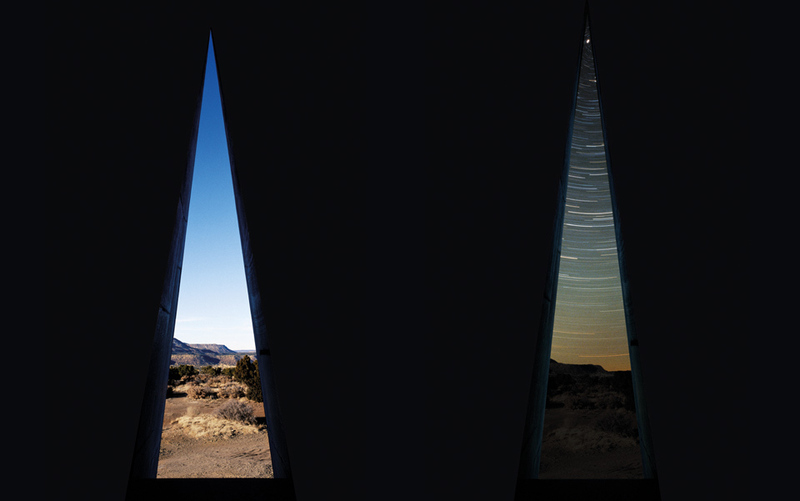 He had acquired a remote patch of land, a mesa he was slowly transforming into a massive work of land art, a naked-eye observatory called Star Axis. Ross rarely gives interviews about Star Axis, but when he does he describes it as a ‘perceptual instrument’. He says it is meant to offer an ‘intimate experience’ of how ‘the Earth’s environment extends into the space of the stars’. He has been working on it for more than 40 years, but still isn’t finished. I knew Star Axis was out there on the plateau somewhere, but I didn’t know where. Its location is a closely guarded secret. Ross intends to keep it that way until construction is complete, but now that he’s finally in the homestretch he has started letting in a trickle of visitors. I knew, going in, that a few Hollywood celebrities had been out to Star Axis, and that Ross had personally showed it to Stewart Brand. After a few months of emails, and some pleading on my part, he had agreed to let me stay overnight in it. Once O’Bryan was satisfied that I was who I said I was, she told me to follow her, away from the highway and into the desert. I hopped back into my car, and we caravanned down a dirt road, bouncing and churning up dust until, 30 minutes in, O’Bryan suddenly slowed and stuck her arm out her driver’s side window. She pointed toward a peculiar looking mesa in the distance, one that stood higher than the others around it. Notched into the centre of its roof was a granite pyramid, a structure whose symbolic power is as old as history. Twenty minutes later, O’Bryan and I were parked on top of the mesa, right at the foot of the pyramid and she was giving me instructions. ‘Don’t take pictures,’ she said, ‘and please be vague about the location in your story.’ She also told me not to use headlights on the mesa top at night, lest their glow tip off unwanted visitors. There are artistic reasons for these cloak-and-dagger rituals. Like any ambitious artist, Ross wants to polish and perfect his opus before unveiling it. But there are practical reasons, too. For while Star Axis itself is nearly built, its safety features are not, and at night the pitch black of this place can disorient you, sending you stumbling into one of its chasms. 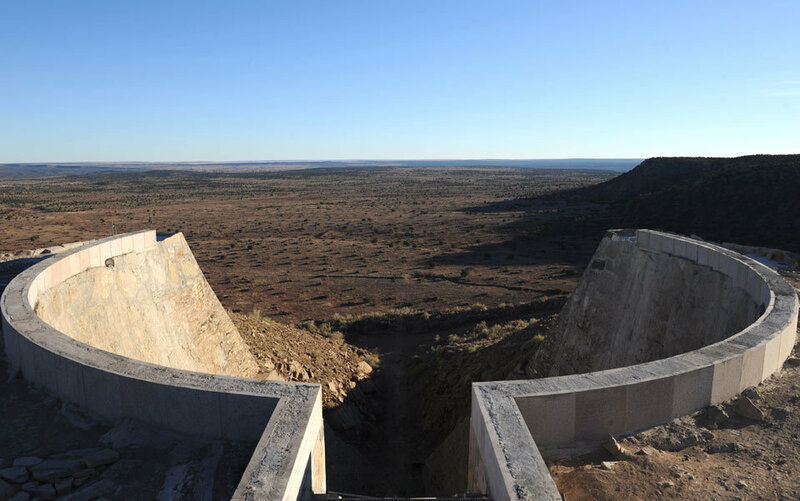 There is even an internet rumour — Ross wouldn’t confirm it — that the actress Charlize Theron nearly fell to her death here. Land artists like to position their works in remote places, so that long journeys are required to reach them. These treks are supposed to prime you. They are supposed to put you in touch with the more elemental aspects of the human experience, the fundamental phenomenology of being a bipedal, rational animal on the wrinkled rock of Earth’s surface. As the city lights fade in the rearview, and the traffic grows sparse, you start to see the land around you more clearly. You notice the topography of it, and the shade and density of its green coat. You feel the wind full-on, unmediated by buildings, and you let your eye linger on distant horizons. You get a heightened sense for this thing we call landscape. Like many works of land art, Charles Ross’s Star Axis concerns itself with one of our richest, most primary ties to the landscape, our relationship to the sky. Ross comes down to us from a lineage of land and sky artists that extends back to the ancient Egyptians, the Ra-worshippers who raised obelisks to symbolise sunbeams, and aligned their pyramids to the stars. And he is not the only one. 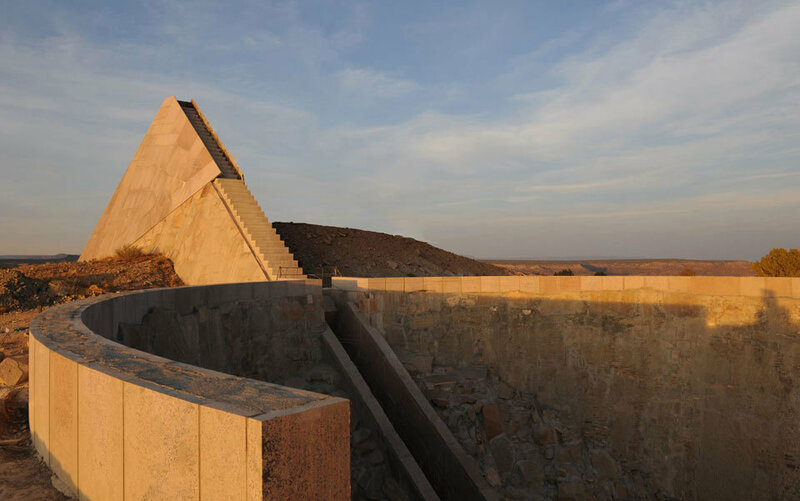 A few years after Ross broke ground at Star Axis, the artist James Turrell began transforming an extinct volcanic crater in Arizona into a naked-eye observatory of his own. 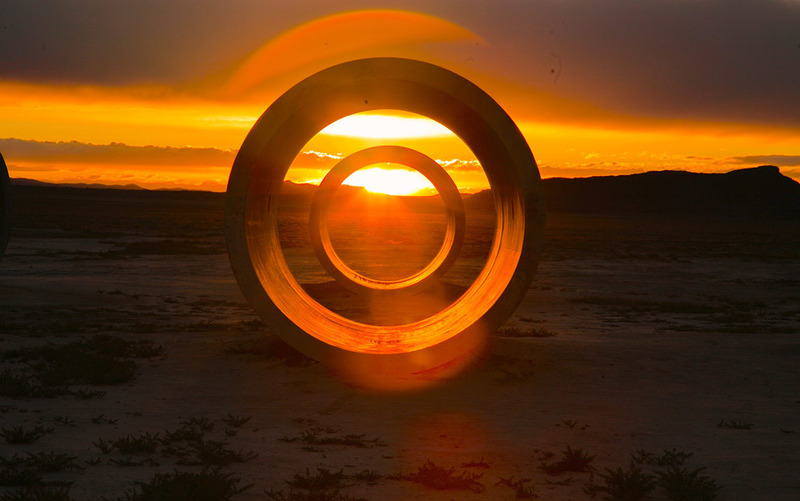 Around the same time, Nancy Holt started in on a Stonehenge-like sculpture in Utah’s Great Salt Lake Desert. She bought a barren salt flat ringed by mountains, way out in the alkaline wastelands, and laid four concrete tunnels onto it, in the shape of an X. Like the arched megaliths on Salisbury Plain, Holt’s tunnels keep time by framing the solstice sun. A few days before I arrived at Star Axis, I had flown out to Utah to see them, on the afternoon of the summer solstice. At sunset, the solar disc had dropped right into the centre of one of the tunnels, giving its curved inner walls an orange, jack-o’-lantern glow. For a moment, the whole sky and desert seemed to fall within the grasp of the work. The assembled crowd had gasped at the effect. It took me the better part of three days to drive from Holt’s tunnels to Star Axis. The night before I arrived, I camped out in New Mexico’s Chaco Canyon, the city-like centre of pre-Columbian Pueblo civilisation. I pitched my tent amid petroglyph-pecked ruins made of mud and stone, in the shadow of the Fajada Butte, a controversial site of ancient solstice astronomy. I stayed up late that night, sipping bourbon by a campfire as the Moon slowly silvered the landscape. Every now and then I would step away from the fire to gaze up at the stars. The flood of lunar light had drowned most of them out, but a few hundred of the brightest could still be seen. There was one I was looking for in particular, a double star named Polaris that sits 430 light years from Earth. Most of us know Polaris by its other name, ‘the North Star’. We call it that because it hovers directly above the North Pole, high enough for everyone in the northern hemisphere to see. It is the reigning king of the circumpolar stars, the white points of light that whirl tightly around the celestial pole, never setting, or even straying, from the same general area of the sky. Mythmakers and philosophers have long associated these stars with eternity, because, unlike humans, or the lower stars that leave the sky for months at a time, the circumpolar stars are ever-present. They circle around the celestial ceiling every night and shun ‘evermore, the blue sea’ as the Greek poet Aratus put it, in 276BC. The stars’ aura of eternity tantalised the great minds of the classical era, especially Aristotle, who, like many ancient thinkers, conceived of nature as a hierarchy, wherein earthly things were temporary and degraded, and the stars perfect and everlasting. As a natural philosopher of the first order, Aristotle took great pleasure in observing and understanding the workings of nature. But he is said to have experienced his deepest intellectual joys while contemplating the clean, circular movements of the stars. It was the place in creation where he could see, most vividly, the work of the unmoved mover, the creative force behind the universe. For him, the stars’ orbital whirls were like whorls at the centre of the cosmic creator’s fingerprint. Aristotle’s teacher, Plato, also carved the natural world into layers, with stars sitting at the pinnacle, but for a different reason. Plato thought that humans were finite, but that we might be able to participate in infinity, intellectually, by bringing the eternal movements of the stars and planets into mind. This association between celestial objects and eternity shows up everywhere in classical Greece, but it didn’t originate there. Its cultural roots reach deeper, suggesting an intellectual instinct of primal vintage. Indeed, the notion that the circumpolar stars make up a metaphysical footbridge, from human experience to cosmic infinity, was already more than 1,000 years old when Plato was schooling Aristotle in the shade of the academy’s groves. In the ‘Pyramid Texts’, the precursors to the Egyptian Book of the Dead or, as it is sometimes translated, the ‘book of emerging into the light’, the circumpolar stars are eternal gods. They sit together in the heavens, banqueting, while awaiting the pharaoh, whose soul would leave Earth to join them when he died. Once departed, the pharaoh would shift forms, becoming a body of light, before ascending into the sky, and to the top of the celestial sphere, where he would orbit, forever, around the fixed pivot of the North Star. Polaris isn’t actually fixed, of course. It sits slightly off the true celestial pole, tracing a tiny circle around it every 24 hours. But to the naked eye, it looks hammered into place, an extraordinary quality for an object of the sky, whose phenomena tend to be fluid. Even the Sun and Moon, the most stately and sizeable celestial objects, move rapidly across the heavens. Others, such as comets and asteroids, leave for centuries at a time, or vanish after a single, dramatic appearance. By comparison, the North Star is a mainstay, a sturdy lighthouse shining out from a treacherous coast. It has become, over time, the star that puts you in context, the one you seek out when you lose your way at sea, or in a vast, featureless desert. Its orienting powers are encoded in ancient mythology, whose stories feature several seekers led by single stars. You see this in the Gospel of Matthew, where a blazing star beckons wise men to Bethlehem, to witness the birth of God’s son. And you see it in the Buddhist tradition, where the Buddha achieves enlightenment after seeing a single star on the horizon. A piece of ancient wisdom sits coiled at the centre of these myths: find the North Star and you will find your way. When I left Chaco Canyon for eastern New Mexico, for Charles Ross and Star Axis, I drove southeast, as though fleeing Polaris. But on another plane, I was headed straight for it. Standing atop the mesa with O’Bryan, underneath the thin pyramid that serves as its peak, I started to get a feel for the scale of Star Axis. I’d seen pictures of it before, but pictures don’t convey the size of the mesa, or just how much of it Ross has removed. Leaning over one of its cliff edges, I could see that he’d gouged a huge half-bowl out of it, creating an artificial canyon that he’d crowned with a smooth, semicircular stone cap. O’Bryan walked me slowly down the steep side of the mesa, to the desert floor, so I could see Star Axis in its entirety. 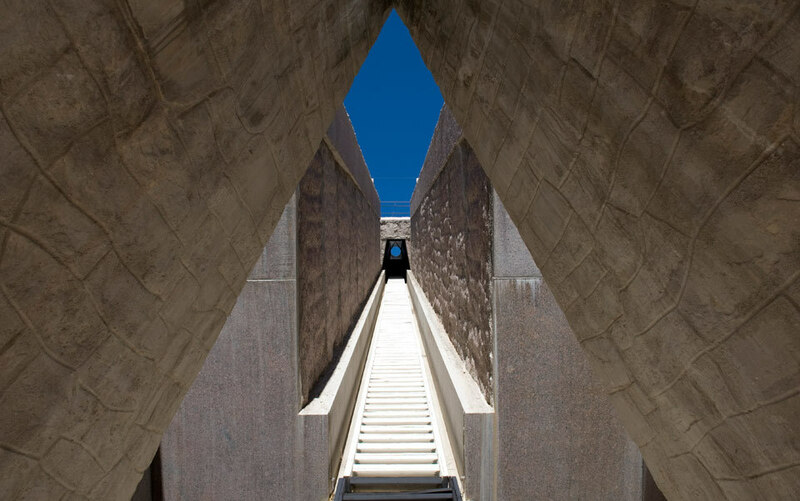 The work’s centrepiece is a 10-storey staircase that lets you walk up through the rock of the mesa, your eyes fixed on a small circular opening that cuts through the top of the pyramid. The first section of the staircase is roofless and open to the sky, but the end of it has a stone overhang that makes it look and feel like a tunnel. This ‘star tunnel’, as Ross calls it, is precisely aligned with Earth’s axis. If you bored a tunnel straight through the Earth’s core, from the South Pole to North Pole, and climbed up it, you’d see the same circle of sky that you do when you walk through Ross’ tunnel. Gazing up through it in the afternoon glare, I saw a patch of blue, the size and shape of a dime held at arm’s length. But if the sun had blinked for a moment, fading the heavens to black, I’d have seen Polaris, glittering at the end of the tunnel, like a solitary diamond in the void. Though it has come to symbolise eternity, Polaris won’t always be the North Star, because Earth’s axis — the invisible line it spins around — isn’t fixed, but instead wobbles, its upper half circling like the bat of a slugger awaiting a pitch. It takes about 26,000 years for Earth’s axis to complete one of these circles, and over that time it points to a number of different stars. Back when the Great Pyramid was built, the North Star was Thuban, a tail star in Draco, the zigzagging water snake constellation. A millennium from now, the double star Gamma Cephei will replace Polaris atop the celestial sphere. Eventually, Earth’s axis will swoop back to where it is today, having completed a full revolution, a cycle that astronomers call ‘precession’ or, in more inspired moments, ‘the great year’. I climbed up the staircase with O’Bryan, getting a feel for the incline in daylight, so I could turn my mind to the sculpture and the stars that night. Once we were back on top of the mesa, she led me to a dark entryway at the pyramid’s base. We used the glow of our smartphone screens to check for snakes, and then walked up a small, spiral staircase that led to a high-ceilinged room, a stone cave with a single open-air window that faced the northern sky. The window was nearly 30ft high, and shaped like a long triangular slit. During the day, the view through it was blue sky bordered by desert, but at night Polaris would materialise at the top of the triangle, like the crowning ornament of a Christmas tree. Ross calls this room the Hour Chamber, because stars that cross the window take exactly one hour to swing, pendulum-like, from one edge to the other. If you’re in here on a clear night, you can see the stars drifting in real time, and if you drop deep enough into the experience, you feel the planet itself, carouselling around on its axis. ‘It’s a really great place to meditate,’ O’Bryan said, grinning. We moved toward the back wall of the chamber, and sat down on a low bench. O’Bryan, who is an artist in her own right, told me she and Ross spend their falls and winters in New York, and live here the other half of the year, in a rustic house, with his-and-hers art studios attached. We talked for a few minutes, until Ross appeared at the top of the staircase, and walked over to introduce himself. He was tall and silver-haired and dressed neatly, in blue jeans and a denim shirt. As we exchanged pleasantries, I noticed he had a slow speaking manner. His mind was quick, but his sentences had an unhurried cadence to them, a metronome quality that was sage-like, but not affected. I also noticed that when he laughed, his eyes would search yours for a moment, as though looking for signs of comprehension. It struck me as the kind of habit you’d pick up if you often felt misunderstood. As a child, Ross never imagined he’d be an artist. He went to college at the University of California, Berkeley, a haven for countercultural creatives, but he majored in mathematics, not art. When it came time to graduate, an adviser told him he needed two units in the liberal arts, and suggested he take sculpture, because it would be easy to pass. ‘They said all I needed to do was mush something mathematical into the clay and I would sail through,’ he told me, ‘but instead, it was a real conversion experience.’ After a month of classes, Ross was totally immersed in sculpture. He said he liked the way it let him play with mathematical concepts that interested him ‘in the flesh’. His earliest works, few of which survive today, were lattice structures made of wood and Plexiglas. In late November 1965, he had a vivid, vision-like dream consisting of technical drawings, the blueprints for a prism. He resisted it at first, ‘as I tend to do with my biggest illuminations’, but the dream proved hard to shake, so he bought the materials and built the prism, the first of many he would exhibit during the 1960s. Years later, he graduated to large-scale prism installations, including the one that adorns the chapel at Harvard’s Business School, and an even larger one for the Smithsonian’s National Museum of the American Indian in Washington DC. At this, he laughed a big laugh, his voice booming off the walls of the Hour Chamber. After the echoes trailed away, I heard a faint squeak coming from the ceiling, right above the triangle tip where Polaris would sit sparkling that night. Ross and O’Bryan had invited me to dine with them at their house nearby. After we ate, Ross and I would return to Star Axis, so I could experience the work in the dark. As we got up to leave, I asked him about the squeak. I followed Ross and O’Bryan in my car, down to the desert floor and then to the top of an adjacent mesa. We parked in front of their makeshift ranch house and headed inside, being careful to step around a six-foot rattlesnake that was sunbathing a few feet from the front door. O’Bryan showed me the bathroom, and explained how to work the manual pump toilet — hold the flush lever down for 20 seconds, then do it again — while Ross went to look for a book he wanted to show me, a collection of essays about quantum mechanics. He returned with the book, and the two of us flipped through it while he gave me a tour of his studio. Ross keeps a close eye on new research in physics, and sometimes enlists astronomers to help him at Star Axis. In the 1990s, Leroy Doggett of the US Naval Observatory measured the staircase’s first and last steps. And the week before I arrived, Ross had an astronomer out from the University of Washington to do the others. I asked him if these encounters with scientists enriched his work. After finishing the tour, Ross and I returned to the kitchen, where O’Bryan was putting the final touches on dinner. The three of us quickly set the table, and sat down to drink beer and eat chips and salsa on a screened porch that overlooks Star Axis. The temperature was settling nicely. The screen let in a breeze that killed most of the evening heat, and the cold beer took care of the rest. I should have been relaxed, but I was feeling anxious. Over the course of the afternoon, a screen of cirrus clouds had slowly spread itself over the western sky, blocking off the sunset. Instead of a blazing solar disc, diffuse pink light poured off the horizon, bathing Star Axis in a rose-coloured shimmer. I remembered reading that the nearby mountains were called ‘Sangre de Cristo’, or ‘blood of Christ’, for the way they lit up red at sunset. As twilight wore on, the wind kicked up and the clouds sailed into the northern sky, where they threatened to obscure Polaris. This wouldn’t be an issue if we were closer to the star, for Polaris is a supergiant, a hydrogen and helium beast as luminous as 2,400 suns. But from this distance, it’s a flickering pixel, and even a thin wisp of cloud can cover it. Over dinner, I asked Ross how he got the idea for Star Axis. In the past, he has said that the Apollo missions inspired him to build it. He once told an interviewer that the images of the Moon landing failed to express the expansive experience of space exploration, and that we rarely ‘recall our sense of being in the stars’. He said that Star Axis is meant to offer ‘a place for that remembering’. I was sympathetic, but I found the story a bit vague. Knowing that Ross was an artist given to abrupt surges of inspiration, creative illuminations so clarifying that they cause him to abandon entire collections of previous work, I figured there must have been an Eureka experience, a singular moment of vision that explained these four decades of toil in the desert. I asked him if he could remember when the idea for Star Axis first snapped into his mind. Ross knew he needed a big sky to work with, so he scoured the deserts of America’s Southwest, looking for a site with a particular quality, one that would reveal itself, perceptually. The first time he stood on the mesa, he knew he’d found it. ‘I had this sensation that my feet were planted on the Earth, and my head was in the space of the stars, and the horizon was right at my midsection,’ he told me. Ross had no idea how he’d ever be able to buy the land, but he kept coming back to the mesa anyway, to make sketches, and marinate in its atmosphere. One day, he was sitting on top of it, when a cowboy rode up to inquire about his purposes. Ross told him about the project, and the cowboy replied, ‘That sounds like something my dad would be interested in,’ and handed him a card with a phone number on it. The staircase at Star Axis is steep. My first time up, I ascended slowly, pausing to take in the view on every step, but still my legs burned by the end. Ross told me that physical exertion is essential to the experience. The deeper into time you go, he said, ‘the greater the physical effort’. The first two steps up the tunnel move you into the future of the night sky, but not by much. The third corresponds to the year 2100, when Polaris orbits closest to the celestial pole. Stepping on to it, I tilted my head up and there it was, the North Star, gleaming in the centre of the tunnel’s end, like a pupil in the eye of god. That photon that formed in Polaris’s core those tens of thousands of years ago would have just broken through its surface in the 16th century, a few decades before Galileo trained his telescope on the North Star. It would have taken off at light speed, flying fast through black space until it reached Earth more than four centuries later. It would have sliced through the atmosphere’s layers in mere microseconds, before beaming its way to this desert plateau, where it would streak down the staircase and slam into my retina, imprinting itself on the rods and cones. From there, it would fly into a final tunnel, no longer a photon, but a symbol, a tiny tile in a mosaic image, one in a long sequence that streams down the optic nerve and into the mind. ‘One may try to look at the sky,’ the scholar of ancient philosophy Thomas McEvilley once wrote, ‘but in fact one looks through it … for no matter how deeply one sees into the sky, there is always an infinite depth remaining.’ When we peer into the sky’s abyssal recesses, its blank blues and deep starlit voids, we catch a glimpse of infinity, and, as McEvilley says, ‘the finite mind has difficulty processing infinity.’ The psychology of this phenomenon was described best by Pascal, the 17th-century mathematician who said the starry sky made him think of time’s crushing enormity. It made him see that human life is a microsecond, beset by two eternities, past and future. ‘The eternal silence of these infinite spaces frightens me,’ he said. And who can blame him? To look at the sky is to be reminded that oceans of space and time lie beyond the reach of our minds. Who can help but feel small under it? By showing us the true scope of the unknown, the sky forces us to confront the mysterious nature of human experience. It puts us face to face with the most basic of truths — that we are all, in some sense, existentially adrift. Humans have devised several strategies to tame this unnerving quality, none more popular than worship. It’s easy to see why. Making the sky into a humanlike God is a shortcut to making it legible. If you believe that there is a man in the sky, you can interpret its unpredictable cinema, its colour shifts and stormy whims, as symbolic messages, communications from the cosmic creator. You can graft human traits and desires onto the sky’s impenetrable infinities, and soothe yourself with the comforting notion that the great unknown resembles you in some important way. This philosophical trick is hard for the order-seeking mind to resist, because it leads to a coherent picture of the world. And so, since antiquity, sky gods have gushed from the human imagination, and several of them survive to this day. In the West, this practice goes back to the dawn of civilisation, to the Sumerians, whose most exalted deity was the sky god Anu. The Ancient Greeks followed suit by putting Zeus, the sky-father, atop Mount Olympus, and so did the Romans, who worshipped Jupiter for centuries before converting to Christ. Eastern polytheisms had their sky gods, too. Shiva, the supreme god of Shaivism, one of Hinduism’s most ancient denominations, is often described as ‘the cosmic man’. He is typically depicted wearing a crescent moon on his head, an ornament meant to symbolise the waxing and waning of creation during time’s eternal cycles. He wears, in other words, a talisman of infinity. If you look hard enough, you can find disguised sky gods hiding in the pages of the monotheistic texts. Even Yahweh behaved like a sky god of sorts, a deity that sent his signs from the heavens. In the Sinai desert, Yahweh appeared to the Israelites as Zeus might have done, as lightning shrouded in clouds. When he wished to judge humanity, he flooded the Earth, by emptying the sky onto it, and signalled his covenant with the survivors by stretching a rainbow across the receding clouds. Yahweh also made the sky the source of his miracles. He aided his people in battle by stilling the sun in its arc overhead, and sent sustenance to the barren earth, in the form of manna from above. Sometimes, he even spoke from the sky. In the Book of Job, the Bible’s most potent locus of philosophical doubt, a righteous sufferer asks Yahweh to account for himself, to explain the ways and workings of his universe. True to form, Yahweh booms his reply ‘out of the storm’. Having climbed the staircase for some time, I stopped on a step that sent me back to the sky of twenty-five hundred years ago, the sky that loomed overhead when the Book of Job was written. I braced myself against the cool stone of the corridor that bracketed the staircase, and looked up through the tunnel. In the 5th century BC, the orbit of Polaris was much further out from the pole than it is now. We know this from our understanding of precession, but also from observations that were recorded at the time, observations that suggest a new way of looking at the sky had begun to emerge by then. Very slowly, it seems, the conceptual filters that humans used to interpret celestial phenomena had started changing, becoming less theological and more empirical. Instead of scanning the sky for the moods and faces of a humanlike god, people began looking for patterns in it. They went searching for order itself in the void. This practice, which we call astronomy, is often venerated as ‘the original science’, but we don’t know exactly when it began. The archaeological record tells us that hunter-gatherers practised crude forms of it. Some used shallow pits — earthworks of sorts — to track the sun’s solstices and the cycles of the Moon. They did this to structure time, to break its infinite drift into increments that would repeat in the future. Just this summer, archaeologists unearthed the most ancient such site ever found, a 10,000-year-old lunar calendar in Scotland. But the earliest evidence of something we would recognise as scientific astronomy comes down to us from the Chaldeans of Babylon, whose priest-like scribes pressed cuneiform markings into clay, to record the rise and set times of the sky’s stars and planets. This custom goes back nearly 4,000 years, but our oldest artefact of it, the Venus tablet of Ammisaduqa, is from the 7th century BC. The tablets that preceded it are lost to time, but the data they carried has survived, by making its way into the astronomical treatises of ancient Greeks, who borrowed heavily from Babylon. Hipparchus of Rhodes was the greatest of the Greek astronomers, and, according to some, the greatest of all ancient, naked-eye observers of the sky. In the 2nd century BC, he logged the locations of the sky’s brightest stars, and set them against the observations of his predecessors, both Greek and Chaldean. He noticed that the celestial sphere had shifted in recent centuries, and from this he deduced precession, a cycle in nature that dwarfed not only years and decades, but all of recorded history. This finding dislodged the North Star, but it also had a Copernican kick to it. By exposing the contrast between the sky’s cycles and those of our own, Hipparchus made it more difficult to see an image of man in it, and thus restored dignity and mystery to its workings. Once you have a sense for the depths of this universe, both spatial and temporal, you see that it is a profound failure of imagination to model its creator after a primate. Better to avoid projection and take nature on its own terms, even if it means admitting bewilderment. And it often does. ‘The deeper they go with this stuff,’ Ross had said, of science, ‘the more mysterious it gets’. Sadly, like the bulk of Babylon’s tablets, the writings of Hipparchus, discoverer of deep time, are lost to us. But here on this mesa, Ross has embodied his discovery in stone. He has pressed it into the earth’s crust, over 40 long years, like a cuneiform mark into clay. When I finished, Ross was waiting for me at the top of the mesa. The two of us climbed a set of stairs that travel up the back of the pyramid, to the peak of Star Axis. I was reminded of his revelation at dinner, that he got the idea for this place while inspecting a sketch of the celestial alignments of the Great Pyramid at Giza. Like the tunnel at Star Axis, the entrance passage to that man-made mountain also faces the northern sky. Some have suggested it was aligned to Thuban, the reigning North Star at the time. The precise functions of the Giza pyramids are a mystery to us moderns, but we do have theories. Most archaeologists think the Great Pyramid was built to be a tomb for the pharaoh, but not in the contemporary sense. If you believe in the afterlife, as the ancient Egyptians surely did, a tomb is a threshold, an earthly leaping off point. Some suspect it was meant to be a springboard into celestial eternity. When I’d reached the end of the star tunnel a few minutes earlier, I’d tried to look into eternity myself. The tunnel aperture is wide up there, as wide as the orbit of Polaris, as viewed from Earth’s surface in 15,000AD. In my mind, I tried to go further than that. I tried to push past the current ‘great year’, the one bound by this specific cycle of precession. After all, Hipparchus might have seen deeper patterns in the sky than his predecessors, but he wasn’t the last link in the chain. Modern astronomers tell us that there are greater years than his, like the sun’s orbit around the black hole at the Milky Way’s heart, which takes nearly a quarter of a billion years to complete. In only a few million, the solar sphere will have blasted its way to a new part of the galaxy, bringing a fresh batch of stars into our sky. The current constellations will have faded from view, even those that sit close to the pole like Polaris. Star Axis will have fallen into ruin by then, but even if not, the aperture at the top of the tunnel will frame blackness. The celestial sphere that once symbolised eternity will have revealed itself to be a slave to larger cycles, immense increments of time that are themselves glimmers in a grander scheme. After all, this universe has rhythms that make the sun’s entire existence look like the flash of a firefly. Some of them are known, like the life cycle of cosmic energy, from big bang to heat death. Others are mysterious, and could forever remain so. Up on the pyramid, I asked Ross if he had considered this, if he had thought about what will happen to his work, when Polaris drifts outside the tunnel. ‘I have no idea,’ he said, sensibly, and with a chuckle. ‘I’m just doing my best to stay within this 26,000-year cycle.’ Recently, Ross has had to turn his mind to more parochial timescales. He has poured 40 years into this work, his masterpiece, but he is ageing now, and he still isn’t finished. He needs more money to complete it, and funding for earthworks isn’t what it used to be. Land art was never a good fit for the commercial art market, because site-specific works are difficult to commodify. A billionaire can’t hang Star Axis in her living room for her friends to see. The movement has also come under critical fire. It has been dismissed as a macho art form, favoured by bulldozer-riding auteurs gassed on the last fumes of the frontier myth. Ross told me he still needs about a million dollars to finish. It’s a large sum, but I expect he’ll find it. He always has in the past. More than money, he needs years, and those are tougher to come by. ‘The race now is for me to finish while I can still walk up the stairs,’ he told me. ‘I’m 76 now, and at a certain point a 10-story staircase might become formidable.’ It’s hard not to feel for him, an artist of deep time, burning with a singular vision, but hemmed in by the slim confines of the human lifespan. He is like the pharaohs, who rode religion and kingly power to the top of the pyramid, but never quite made it to the eternal realm of the stars. Ross got there more honourably, with art and science, but infinitude eludes him just the same. Which void he meant, Ross didn’t say, and I doubt he would have told me if I’d asked. But he did say something illuminating about his experience up there on the pyramid, his shock and delight at seeing the abyss staring up at him from the pit below. ‘That’s the pleasure and the reward of not controlling the design of this place,’ he said, smiling. ‘The geometry is fixed, but there are a lot of different ways it can manifest.’ No one can know whether Ross will finish his work here before time overtakes him, but in the end I don’t think it matters much. Watching him grin that night, like a coyote in the moonlight, his body suspended between the land and the sky, I could see, all at once, that he got what he came for.